DSCC says that Samsung's foldable 7.3" 2152x15236 AMOLED panel (the one that will be used by Samsung's first foldable OLED device) currently costs almost $180 produce (and SDC will actually lose a bit on every panel sold). 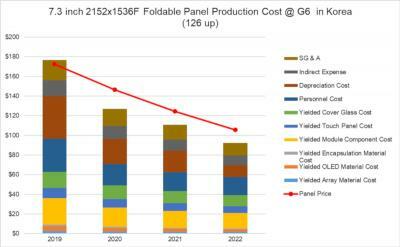 SDC will be able, though, to quickly lower its production costs which will reach around $90 for each panel in 2022. Cost reductions will enable SDC to maintain a good profit margin on these foldable displays from 2020 onwards. The main reason for the current high prices are SDC's low yields on foldable AMOLEDs.